Want to make your landscape beautiful? Cal us! New Year’s Resolution: Get Your Lawn In Order! 2016 is your year. You have jumped the gun and already made your New Year’s Resolution. It is one you have made before, but this year you are actually going to get it done. You are finally going to take care of your lawn the way it should be taken care of. You are sitting on an acre and a half of land that is lucky to be cut 6 times a year, but this year is different because you are going to call Hutcheson Horticultural to help get your lawn in tip-top shape for those outdoor parties you have always wanted to throw, but have always been too ashamed of your yard to actually do. Our friendly and knowledgeable staff will come to you and customize a plan that is just right for you and your needs! 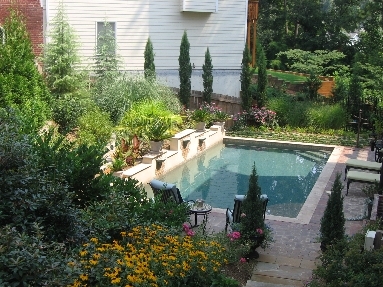 Hutcheson Horticultural is proud to offer Design Services to all of our customers! This means you will get a designer that caters to you. When designing your custom landscape plan, we not only consider the aesthetics of the overall look and design, but also the functionality of your lawn. Things like drainage, maintenance requirements, and elevation issues are all things we take into consideration when designing your landscape! We also offer Installation Services, and will help you choose just the right plants that will accentuate your lawn! A nice lawn will also increase your curb appeal, which is especially important if you are thinking about selling your home in the next six months.We will work closely with you to determine the best solution for your needs and budget, and develop design plan that works best for you. To request a meeting with one of our talented designers, you can either email us at: designteam@hutchhort.com, or simply call (770) 924-1001.